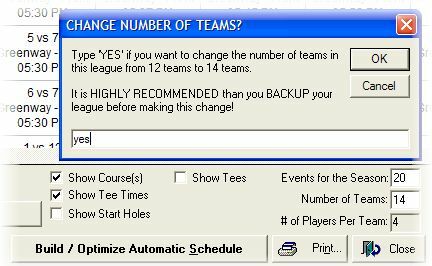 It is highly recommended that you BACKUP your league before changing the number of teams. This is a precaution, just in case you need to revert back to the original setup. Note: Ideally changing the number of teams, whether increasing or decreasing, should be done before season play begins. Changing the number of teams during the season can wreak havoc with the remaining schedule. The information which follows assumes you are making a change before season play starts, although item 2 under increasing teams could be a midseason solution. You want League Manager to rebuild the schedule to include new teams in the mix. Note: League Manager will rebuild the automatic schedule. You want to preserve the existing schedule, do not want the existing schedule altered. Pull down the Setup menu and select “Manual Scheduling”. Type the new number of teams in the “Number of Teams” box. Press Enter. Type “yes” to verify this change. Note: The new teams you added will not be paired with the existing schedule. This could work for a mid-season change. The previously scheduled matches will be maintained as before and the new teams will be paired only against each other. Type the new number of teams in the “Number of Teams” box. Click anywhere on the screen. Type “yes” to verify this change. Note: Since some teams will be deleted, League Manager must completely rebuild the schedule.